I usually answer reader’s questions directly, but reader Mary asked that I do a post to answer her question and I’m happy to oblige. I’ve seen a lot of bloggers try doing sugar detoxes but they never explain the foods that actually have sugar. I know that sounds stupid but could you do a post on maybe hidden sugars and foods that have it? I know it may seem easy but I feel like there a foods that secretly have a lot of sugar! 1. Do you mean food that really doesn’t need sugar, but manufacturers insist on putting them in anyway? 2. Do you mean food with funny (and often unpronouncable) words for sugar? 3. Do you mean food that you wouldn’t typically think would contain sugar, but do? Can you tell I’ve given this some thought? Let’s start with question numero uno. 1. Food that doesn’t need sugar but manufacturers insist on putting sugar in them anyway. Ever wonder why some nut butters are just so darn tasty while others, while still tasty, don’t insight nut butter cravings? Take a look at the label. Many of the “healthy” and expensive nut butters add sugar. It’s not typically high fructose corn syrup or straight sugar. What’s usually added is evaporated cane syrup. 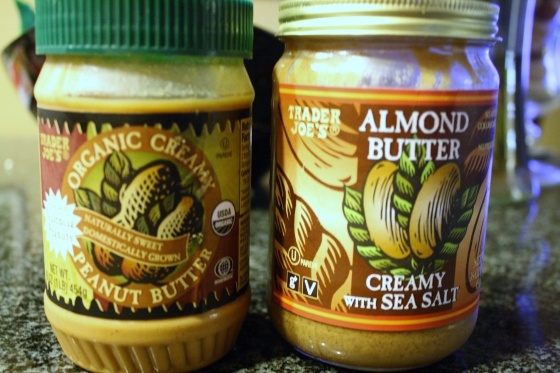 Most of Trader Joe’s brand nut butters do not contain any added sugars. Their only ingredients are nuts + salt + oil and sometimes without salt if that’s what you prefer. You should still look at the ingredients just to double check. My two fridge staples: TJ’s organic creamy peanut butter and almond butter with sea salt are sans sugar, which makes my bowl of oats that much more delicious. I’m not sure why manufacturers put sugar in tomato sauce/marinara, but they commonly do. If you took a poll of your grocery store red sauces, you would be hard pressed to find one without some kind of sugar. It’s completely unnecessary, as I have never added sugar to a homemade sauce. Trader’s Joe’s organic marinara sauce has zero added sugar. You’ll still find a few sugar grams in there because tomatoes have natural sugars. If you’re interested in purchasing this marinara, make sure you get this exact label. 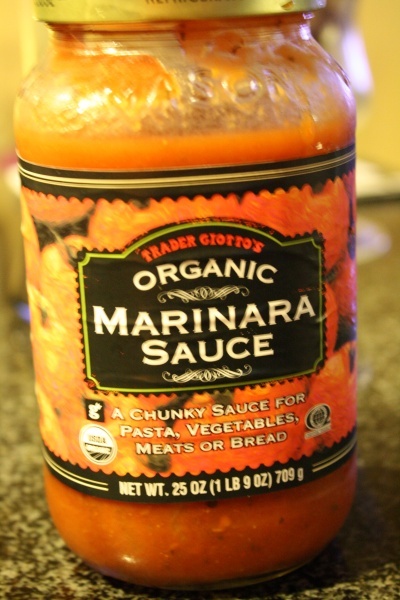 TJ’s has another organic marinara that does contain sugar so pay close attention to the label and ingredients list. I used to wonder why some bread tasted so good, I wanted to eat piece after piece. Well duh, Kelly. It’s because some breads have added sugar. That subtle sweet taste that makes some breads so delicious (and easy to over-eat) is sugar in some form. It might be honey or some nice little version of sugar wrapped up in a “healthy” bow, but it’s still sugar. Ezekiel bread has no added sugar. In fact, the whole line of Ezekiel 4:9 products from Food for Life was created with diabetics in mind and have the Diabetic Friendly Seal. I rarely eat bread by itself and typically put something on it like cheese, peanut butter, or the numerous ingredients for an open faced sandwich. I don’t miss the sugar at all. 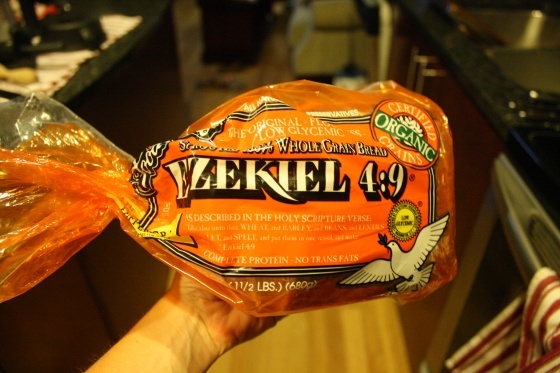 Ezekiel bread is at its tastiest when you toast it, plus it freezes well for easy storage. See Bread above because the same exact thing holds true. 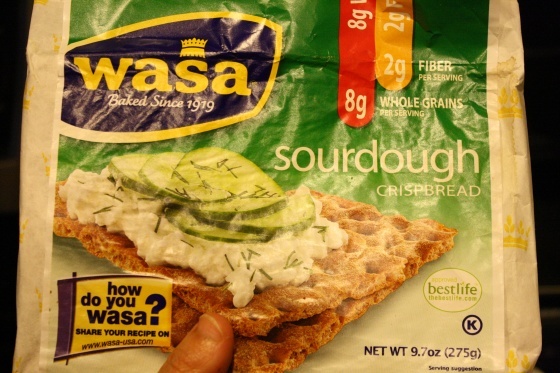 Wasa crispbread (which I sometimes spell Wassa because I pay no attention to these things) has no added sugar. Their only ingredients are flour, water, and salt, plus any added ingredients for the particular flavor of crispbread. For example, sourdough was added in this case. I love their crunch! This one is a doozy. Look at the labels and sugar content. Most condiments and salad dressings contain added sugar. Hello, Ketchup! Why do you think I love it so much? Seek out condiments without sugar like Texas Pete, Annie’s Green Goddess Dressing, no-sugar salsas, mustard, or better yet, make your own. If you’re okay with Stevia, you can make sweet sauces by subbing in the Stevia for sugar. For salads I like oil and vinegar, or a squeeze of lemon juice, and sauces made with Greek yogurt, fresh herbs, and sometimes a finely chopped cucumber. Be creative or skip the condiment and let the flavor of the food stand alone. Moral of the story: Read labels and never assume that because you don’t think of a food as a “sweet” that it doesn’t contain added sugar. Now let’s get to the second question. 2. Food with funny (and often unpronouncable) words for sugar. That’s easy! Here’s a list of sugar pseudonyms. Moral of the story: Get familiar and read your labels if you want to avoid sugar. And finally, we come to the trickiest of the three questions. Here’s a little secret: almost everything contains at least a little bit of sugar. Google the nutrition information for any non-sweet food that comes to mind and chances are, there is at least a gram of sugar in it. Unless it’s a leafy green, a nut, or unprocessed meat, it’s hard to find food that has 0 grams of sugar (except those with artificial sweetners). But the amount of sugar greatly differs based on what is added. If you want to do your own sugar detox or cut back on sugars, you need to decide how astringent you’re going to be. Are you going to read labels for sugar content? For the most part, I chose not to do this. I look for added sugars in the ingredient list and decided to limit fruit which is the whole food that contains the most amount of naturally occurring sugar. Of course, if you’ve been following my detox, you’ll see that I’ve basically stopped eating most processed foods except some of the products I showed you above, because almost all processed foods have some form of added sugar. Then there are the whole foods that have sugar. Yes, whole foods have sugar too. You already know that fruit has sugar, so I’m not going to really address that. If you’re interested, here is a good list of most fruits and their sugar content. Other veggies have sugar too, but these are the ones that have the highest content. Moral of the story: Only you can decide what you want to avoid and incorporate in your diet. These higher than average sugar content veggies have a lot of redeeming qualities that are important for your health. But you should know that even veggies have sugar. So there you have it! Not so easy, huh? It’s not as cut and dry as you would think when you decide to cut back on sugar. If you’re interested in reducing sugar, you have to figure out what you want to concentrate on in your reduction that best meets your dietary needs, goals, and health (mental as well as physical). I knew that counting sugar grams would not be very good for my mental health so I chose not to go that route. But that doesn’t mean that you should rule it out for yourself. You know what’s best for you. If you have any questions, comments, or feedback about sugar or my sugar detox, I would love to hear them. Feel free to email me at foodiefresh@gmail.com or leave your feedback in the comments. So true that it’s hard to spot the hidden sugars — but it’s easier with this little cheat sheet! 🙂 I didn’t realize that sugar was present in most of my veggies until I did the sugar elimination diet I told you about…it was tough, but I noticed my skin and mood improved a lot when I was watching my sugar intake. I think everyone’s journey is different, but we can all benefit from at least investigating how our body functions with a little less sugar. 🙂 Great post, Kelly! SUCH an informative post! Thanks Kelly. I’m kind of like you… I eat a little bit of sugar and go crazy with sugar cravings that just won’t be satisfied. I really should do a sugar cleanse to get back to appreciating sugar in smaller quantities, but it’s so hard to just DO it. You’re helping me see that it is doable though, so thanks. GREAT post! my problem is usually with yogurts and bars. I love flavored greek yogurts but man they have a lot of sugar in them! i used to only eat plain greek yogurts but somehow i converted to flavored (prob bc it tastes better? ), but i should def go back. i love snack bars too but they’re always high in sugar. good info, thanks!